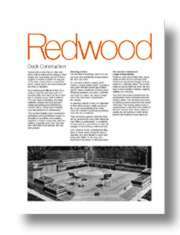 These project and information sheets are available here courtesy of the California Redwood Association. All project sheets are free in PDF format. 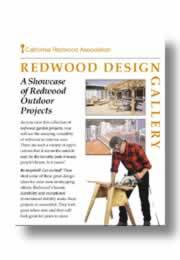 Hard copies of this literature may be ordered for a small fee directly from the California Redwood Association web site. Detailed do-it-yourself plans for an attractive steps and bench for spa. Includes artwork and materials list. 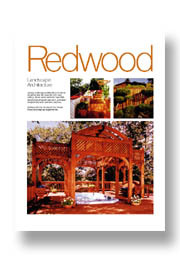 Easy do-it-yourself plans for a traditional redwood picnic table. Includes artwork and materials list. Plans for building a deck over an existing concrete slab. Includes artwork and materials list. Great idea booklet with over 30 photos. 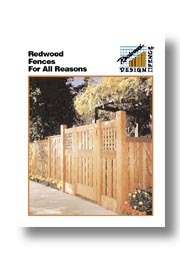 Also includes construction drawings for dozens of fence designs and step-by-step building instructions. 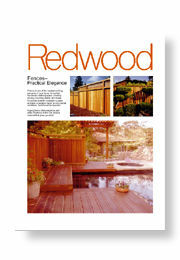 A showcase of redwood outdoor projects. 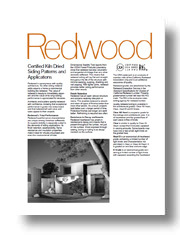 Illustrated guide to the general purpose redwood grades. 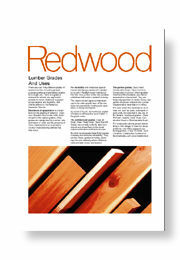 Full size details of all the standard redwood lumber patterns.